on 27th-29th of October ABC Warsaw invites you to join 4th edition of Antiprison Days in Warsaw. The main topic of this year is “Support your local ABC”. Here in Poland, we see the need of discussion about the big role of anti-rep structures in our struggles so we would like to invite different people and groups to share their experience with repressions and how it was possible to deal with them. There will be also space to talk about difficulties in being support group and why and how anti-rep and anti-prison campaign is part of every social/land/climate/world struggle. 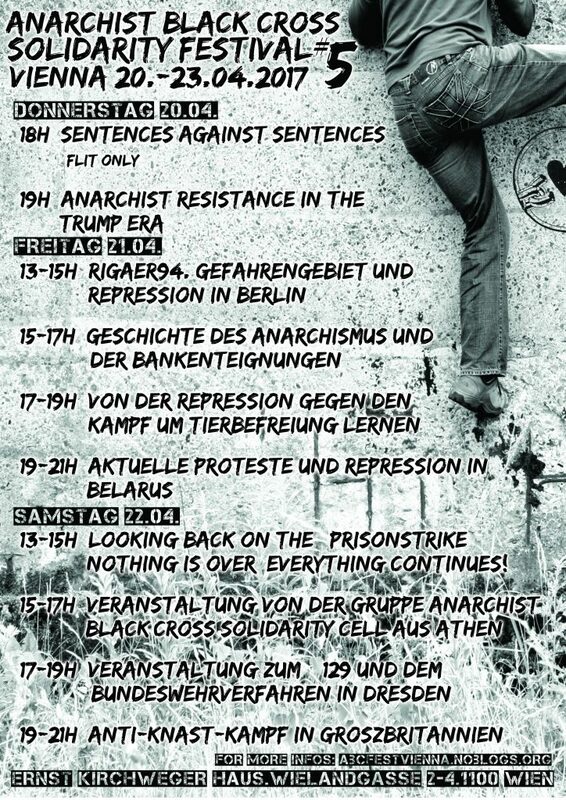 In this event the comrades from “ABC – Solidarity Cell” will talk about the importance of solidarity with anarchist prisoners and the connection of struggles inside and outside the walls. Further, the talk will contain a deconstruction of the meaning of the ‘anarchist movement’ and the myth of the district of Exarchia. – The conditions in prisons and the situation of anarchist prisoners in Greece. – The importance of solidarity assemblies for the anarchist prisoners and the connection of struggles inside and outside the walls. – The choice and the importance of the armed struggle, the claim of responsibility for direct actions and the particulars of participation in armed organisations, and the importance and consignment of those choices. – The choice of jail-breaking. – The position of women in the armed struggle. It will be also possible to raise questions to the comrades in prison, so the communication will be in both directions. There are times when you feel a certain kind of strength inside you. Nikos Romanos State prison of Korydallos – Mens prison-ward A’, P.C. Other events @ the ABC Festival Vienna you can find here. This is a banner from Greek prisoners (Koridalos Athens) to be forwarded to American prisoners. 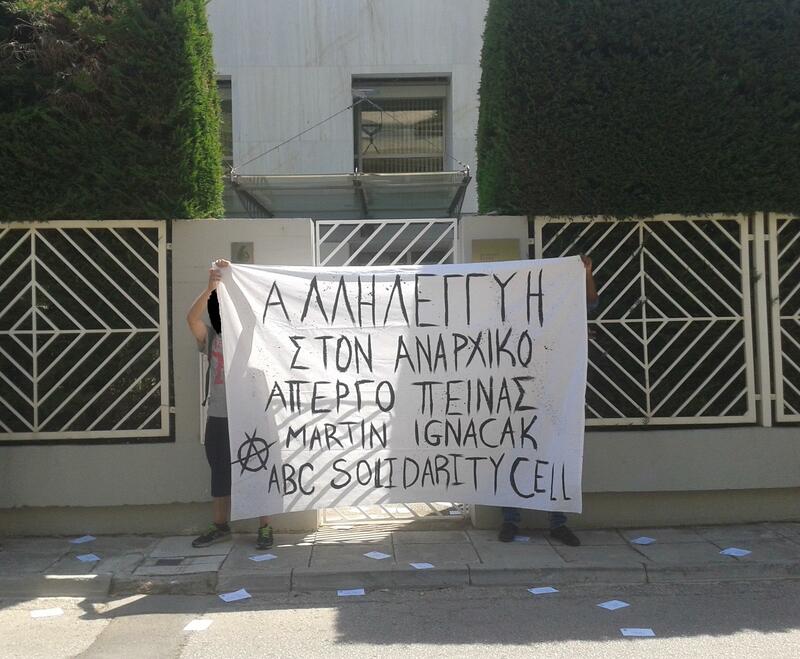 Inside the framework of the international day of solidarity to the struggle of the US prisoners that was called by the Anarchist Black Cross-Solidarity Cell, a protest outside of the American embassy took place. ABC solidarity cell, Assembly for solidarity to political prisoners, Assembly for solidarity to the prisoners’ struggle against slavery, A.S.M.P.A., Assembly of anarchists communists for the class counter attack against the European union as well as other comrades participated in the protest. During the protest, slogans were shouted, flyers were spread, texts were given out and banners were hanged. In order to be in the position to understand the importance and necessity of the us prisoners’ struggle, we first need to analyze the role of slavery in the foundation and evolution of the american state and its historical and integral ,until today, link with the capital. Slavery in its many forms was actually the foundation on which the omnipotence of american overlordship was gradually built. The root of this phenomenon can be traced back in the era when the christian empires of europe started a race to conquest unknown lands, founding colonialism regimes, in the era of brutal genocides of the indigenous populations and the slave trade of the non-white african population. Since then and until today, the social and political circumstances have rapidly changed, mainly because of a heavy blood tax that has been paid from beneath, towards the direction of the total shaking off of slavery as an institution. However, it continues up until today, more or less covered. 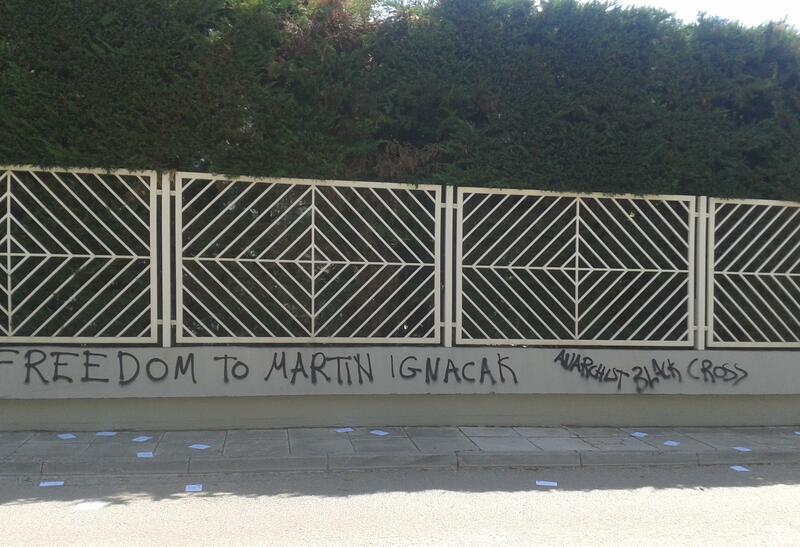 Update by AntiFénix: Martin has suspended his hunger strike. In April 2015, the Czech State launched a repressive campaign under the name “Operation Fénix” targeting the anarchist movement that’s active on its territory. Raids on fighters’ homes, arrests, personal belongings confiscated, relatives and friends of the arrestees harassed, and accusatory dossiers cooked up in police offices. Eleven fighters were arrested as a result of this operation, of whom four were sent to remand prisons of the Czech Republic, while the rest were given restrictive bail conditions. All this has been portrayed in the media as a coordinated effort towards dismantling “terrorist networks”, such as the Network of Revolutionary Cells (SRB) who’ve claimed responsibility for dozens of incendiary attacks against statist and capitalist targets. 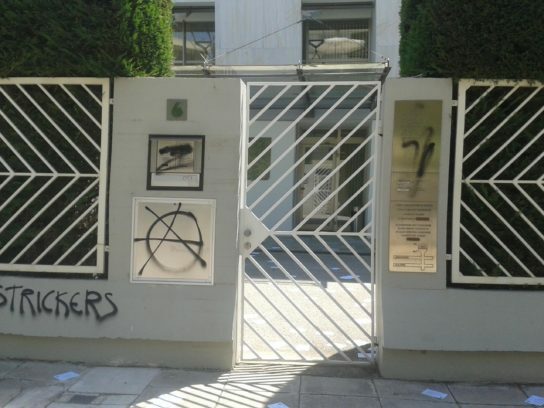 Also one of the comrades is charged with participating in another attack that, according to the media, was carried out with Molotov cocktails against the house of the Minister of National Defence.